Another Boloney hero has left us and ventured off to the great point break in the sky. Patrick Swayze lived as he died - inspiring us on the beach, to the sky, to the slopes. 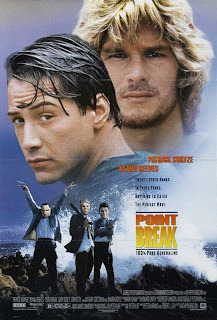 Just this summer several boloners lived out "Operation Swayze" when in Point Break fashion, Pukey was abducted by Dong and myself, and thrown out of a plane at the early hour of a summer day. Many of Boloney's key mantra's stem from the wise words of the Bodhisattva - the ultimate searcher. Rules to live by: 1) fear causes hesitation, and hesitation causes your worst fears to come true. 2) If you want the ultimate, you've got to be willing to pay the ultimate price. 3) It's not tragic to die doing what you love. As Swayze said about Point Break, "It's a statement about our society... of giving up on yourself and becoming part of a system rather than staying an individual." So tip your drink to this hero, and remember to take words of wisdom from two other Swayze classics, Road House and Red Dawn, and be thankful for the insight he provided us all with.